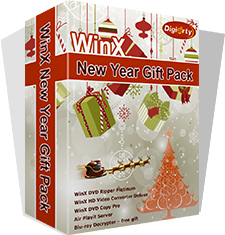 WinX New Year Gift Pack is a 5-in-1 Pack that comprises of the following components: WinX DVD Ripper Platinum, WinX HD Video Converter Deluxe, Air Playit, WinX DVD Copy Pro and Blu-ray Decrypter. This pack can help you easily clone/rip/burn DVD, download and convert video as well as stream movie/music to your iPhone, iPad and Android devices. WinX DVD Ripper Platinum is a Windows-based DVD ripper software capable of ripping any DVD (incl. latest encrypted DVD discs and ISO images) to mainstream videos, such as rip DVD to AVI, DVD to MP4, H.264, MPEG, WMV, MOV, FLV, 3GP, etc. It can also help users faultlessly convert DVD to Apple (iPhone 5, iPad 3/4/Mini, iPod Touch 5, Apple TV, iTunes), Android (HTC, Samsung Galaxy Tab, Kindle Fire), Microsoft (WP8, Surface Tab), PSP, etc. WinX DVD Ripper Platinum brings a superfast DVD ripping solution thanks to the cutting-edge tech to support Multi-core (up to 8) CPU and Hyper-threading. Besides 350 built-in profiles, WinX DVD Ripper Platinum has 3 DVD copy modes to meet users’ up-to-date DVD backup demands – clone DVD disc to ISO image; copy DVD title to multi-track MPEG2 file with all videos/audios/subtitles; backup main content of a DVD for playing on PC, PS3, Xbox, Media Center, etc. The latter two Copy modes cost you 5 minutes only! WinX HD Video Converter Deluxe, all-in-one video software as HD video converter, DVD burner and YouTube online video downloader, can give you ultimate control over your video files. With 160 video codecs and 50 audio codecs packed in, it owns powerful capability to meet all your video conversion requirements without assistance of any third-party codec. WinX HD Video Converter Deluxe enables you to convert between all mainstream video formats, including High Definition video MKV, M2TS, MTS, AVCHD, H.264/MPEG-4 AVC, and regular video AVI, MPEG, MP4, WMV, MOV, FLV, RM, RMVB, WebM, Google TV, etc. Moreover, it features unique technology to support Multi-track HD videos available in BDAV, M2TS, MKV, AVCHD, HDTV and MPEG-TS formats. Thus, without a second thought about format compatibility, you can play your videos with all Windows media players, Surface Tab, iPhone/5/4S, iPad/3/Mini, iPod/5, PSP, Android and DVD player. WinX DVD Copy Pro is specially designed to meet users’ up-to-date DVD backup demand: clone DVD to DVD disc for safe storage; copy DVD to ISO image for later burning, playing or ripping; copy DVD to MPEG2 file with intact content for further usage in media center, DVD library establishment and DVD playback in PS3, HTPC. Equipped with ISO mounter and DVD burner, WinX DVD Copy Pro can also help mount ISO to a virtual drive and burn DVD to DVD. Without any third party DVD decrypter, WinX DVD Copy Pro has unlimited access to all region codes and copy protection systems. It faultlessly supports Disney’s Fake, severely scratched DVDs and Sony ARccOS bad sector, while these three obstacles beat off most of DVD copy software in the current market. WinX Blu-ray Decrypter is a professional Blu-ray decrypting and copy tool for users to decrypt and backup Blu-ray to M2TS video file or Blu-ray folder (compatible with Win7 Media Player). It is able to remove and decrypt encryption (AACS MKB v25), BD+ copy protection, etc. in Blu-ray disc. With this program, you can effortlessly protect your beloved Blu-ray discs from scratch or loss. WinX Blu-ray Decrypter is an ideal Blu-ray backup solution which supports both Full Disc Blu-ray Backup and Title Copy modes. It allows you to decrypt Blu-ray Disc with all known copy protections and encryptions and backup 3D Blu-ray to 2D video in only 3 clicks. It also brings fast decrypting speed while preserving original video/audio quality. If you are looking for powerful software to backup and decrypt Blu-ray video disc, WinX Blu-ray Decrypter is the way to go. No trial is available for WinX New Year Gift Pack. You can download trials for separate components. WinX New Year Gift Pack offers 75% savings over the price of individual components. It costs 45.95 USD for 1 PC license and 49.95 for 5 PC license.